I’ve written often about the changing nature of sales in the B2B world. As selling has gained more complexity – buyers have gotten more sophisticated and turn to the Internet as their primary vehicle to initiate the learning and evaluation portions of the buying process – the nature of what it takes to be a successful salesperson has evolved. Knowing my take on this, my brother sent the chart below from Harvard Business Review’s The Daily Stat. It highlights the competencies hiring managers are now looking for when hiring salespeople. Consider this, as recently as the year 2000, 30% of sales job profiles included “developing sales leads” as a core part of the job description; today it’s less than 8%. 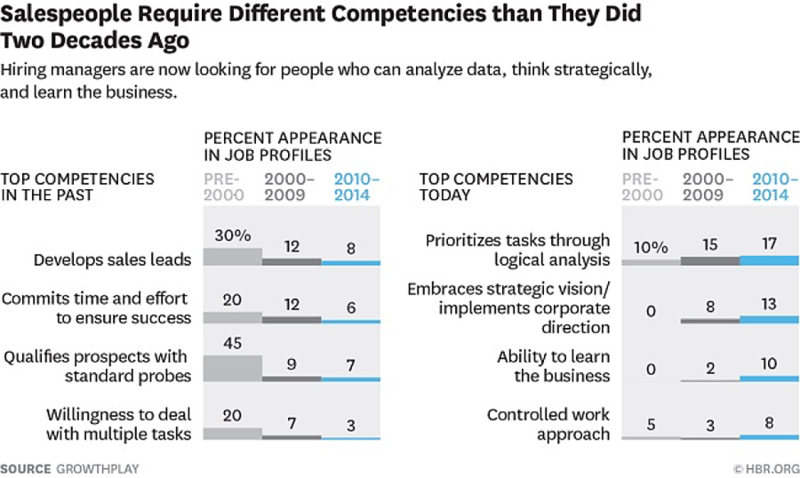 Today, the ability to prioritize tasks through thoughtful analysis, embrace strategic vision, and learn the business are the most sought after competencies. It’s taken quite some time, but increasingly the job market is looking more for “business people who can sell” rather than salespeople. In its simplest form, this means that if you’re looking for the traditional viewpoint of a salesperson, no matter how good your recruiting and training may be, you’ll be preparing the business (and your team) to succeed in 1995, not 2015 (let alone 2020). It is time to (if you haven’t already done so) completely rethink what it means to be a salesperson for your organization, design your job descriptions around this new definition and execute the systems designed to work in today’s world. This means that you must accept the relatively new fact that it is your customer, not the sales manager or salesperson, who exerts the control today. Your salespeople, first and foremost, must be viewed as important assets to your customer. You must move from an “always be closing” approach to an “always be helping” mindset. This does not mean that you should not hold your salespeople (and your marketing people for that matter) accountable to a revenue quota. Nor does it mean that you should not expect that your salespeople consistently advance opportunities towards a decision. Actually, you should demand it. Lastly, it in no way means that salespeople are less important than they used to be (if anything they’re more important). Any pundits putting forth the myth that buyers desire or have the ability to navigate the entire purchasing journey on their own should be rebuffed as the fools they are. What it does mean is that you must embrace the world as it is, and structure your systems, processes and disciplines to align with a much more complex competitive environment. You must accept that buyers are more sophisticated, have access to greater knowledge than ever before and that the way to generate demand today is as important as how or what you sell. It’s no longer enough to be a skilled orator and an expert in your solution to be a successful salesperson. Today you need to be an expert in your customer’s business if you want to be valued. This means that the salespeople that possess strong business acumen are going to be the most successful. Twenty years ago I would have selected someone strong in sales attributes but weak in business acumen over someone who had the business chops but wasn’t as strong on sales skills or attributes. Today the opposite is true. Effective B2B sales today is such a team effort that I can make up for many of the sales weaknesses someone may have, but I can’t make up for a lack of business acumen. Marketing today needs to be the front line of selling. The sales process is simply too complex and demanding to rely solely on the sales team to drive sales results. Buyers want access to the information and knowledge they’re looking for, when they’re looking for it and packaged in the manner they want to receive it. If you’re not creating the content and delivering it in the manner they desire, you’re losing sales. 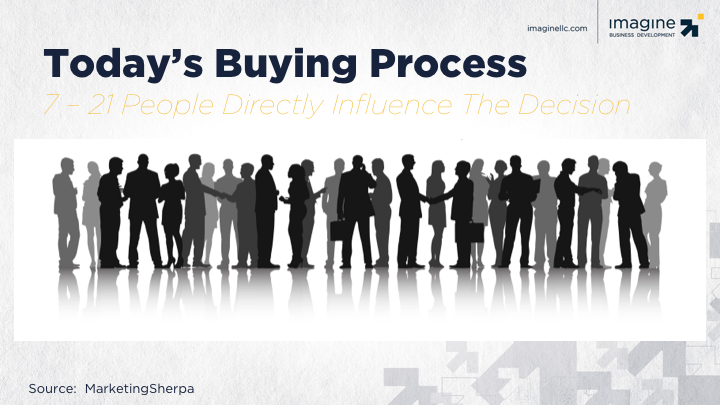 Additionally, as more companies move towards consensus type buying patterns, more people are involved in the decision; too many for salespeople to address directly. I’ve visited many companies whose sales side is struggling to produce consistent results. Not one of them had a strong marketing program supporting them. On the contrary, I’ve not seen a company with a strong sales side that didn’t also have a strong marketing program. Increasingly I’m convinced that the reason for that is that if you want strong results at the bottom of your funnel, you must first get strong results at the top and the middle of your funnel. Always be experimenting. Your world is changing constantly, be sure you’ve built your system for that environment. As Stacy, our marketing manager, recently shared, annual planning is increasingly useless. A quarter today is akin to what a year used to be for most companies. Big marketing and sales plans simply don’t work any more. Move from infrequent, deep reviews to frequent updates on progress. Design your systems to proactively identify where leads and opportunities are getting stuck, and have a plan to respond. Realize that the environment is constantly shifting for your customers as well as your company, and provide the leadership to help them navigate the environment. The bottom line is that if you want to sustainably grow in the future you must orient your entire go-to-market approach – from who you hire, and how you hire, train and deploy your sales and marketing assets – to succeed in the world we’re in, and not the one you’re used to.